When two handsome men are vying for your affection, what's a gal to do? If you're Jean Arthur, you bask in the attention. If you are pre-code Miriam Hopkins, however, you take the triangle as far as it can go--all the way. 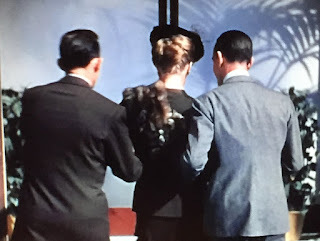 In Design for Living (1933), Gilda (Hopkins) meets a pair of struggling artists, painter George (Gary Cooper) and playwright Tom (Frederic March). Both make her tingle--one from toe to head, the other head to foot, and she cannot decide whom she likes best. So what does she do? Moves in with them to act as their muse. Nothing more per a "Gentleman's Agreement." It works fine until Tom is called away on business and carnal desire proves too strong for the remaining two. Hopkins dramatically proclaims, "I am no gentleman." The triad is broken up. Gilda and George go one way, Tom the other. All is well until Tom turns up one day while George is away. 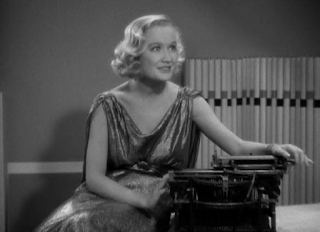 Gilda's bell still rings for Tom--figuratively and literally--she really does ring the bell of his old typewriter. All that is needed to land March in the sack: a little ring-a-ding-ding. It doesn't take long for George to deduce what has occurred. And just like that, they are back in the same spot: two men in love with a woman who cannot stand the thought of losing either of them. So Gilda decides to live with neither. She gives up both to marry Max Plunkett (Edward Everett Horton), a man with whom she has no romantic attraction. Married life and Gilda do not meld. When her two princes arrive to rescue her from the monotony of traditional living, she is more than happy to escape with them. This time she tosses all mores out the window. The three make another "Gentleman's Agreement." However, Gilda seals the pact with a passionate kiss to each man, making clear the agreement is in name only. Let the immoral fun begin! 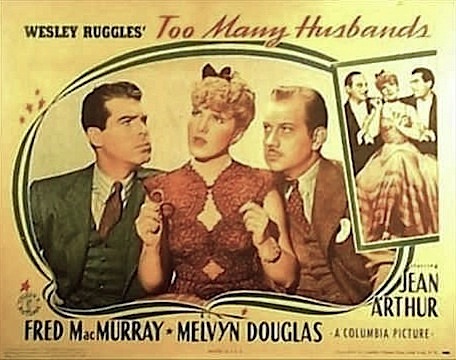 Seven years later, Jean Arthur's character, Vicky, faced a similar problem in Too Many Husbands (1940). Code was in full enforcement, though, so the heroine's "familiarity" with two men--and her inability to choose between them--required a carefully concocted backstory. The first husband, Bill (Fred MacMurray), was lost at sea and presumed dead, paving the way for Vicky to marry husband number two, Henry (Melvyn Douglas). When the first turns up alive, Vicky knows she should choose between the men, but she has been the forgotten wife twice, left behind for foreign adventures and business meetings. (Why Vicky did not go along on Bill's trips is a mystery.) The idea of being the center of two husbands' universes proves too alluring. 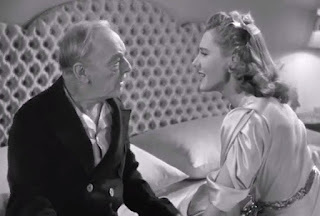 "I like my husbands to love me, to fight for me," Vicky explains to her father (Harry Davenport). The boys are banished to the guest room until further decision can be made. The dilemma for Vicky and the audience is that there is no clear winner. Unlike the more popular My Favorite Wife, released the same year (but written without knowledge of Husbands), both Vicky's marriages have been consummated. Both men are fair game. And Vicky would be equally happy to receive either gentleman in her bedroom. "I'll be waiting. In my room." 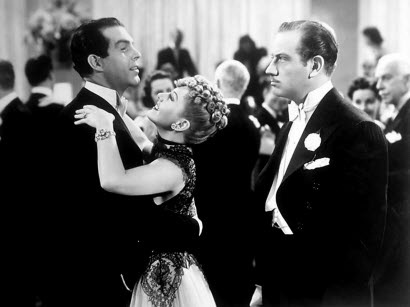 According to TCM writer Rob Nixon, Columbia had a difficult time deciding with whom Vicky should forge a permanent relationship. The studio filmed two endings and asked college coeds their preference. Judging by the ending, there was not a consensus. Bill, the victor, dances with Vicky while Henry begrudgingly watches. Douglas is so gosh-darn adorable, the studio couldn't leave him solo. Here is where the boys' secretary, who is in love with both (shown earlier in the movie), should have reappeared in my opinion. Instead Vicky invites Henry to join in the dance. The movie ends with all three on the dance floor, dancing ring-around-the-rosie style. As to what happens next is anyone's guess. As a student of film, the ending is remarkable considering the censorship code in place at the time. As a viewer, the lack of closure is unsatisfying. The film also lends itself to a queer reading. Visit World Cinema Review to see how. I rounded out my January viewing with yet another story of an unresolved love triangle. 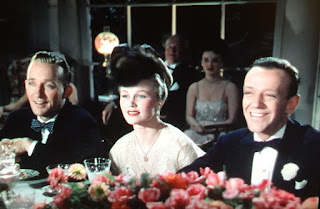 This time Bing Crosby and Fred Astaire competed for Joan Caulfield in 1946's Blue Skies. Truth be told, the love triangle is rather mild. Made over a decade after Design for Living, the code was a fixture in Hollywood and left little wiggle room. While Johnny (Crosby) and Jed (Astaire) are both in love with Mary (Caulfield), she prefers one over the other. She almost marries Jed twice, but she goes through with the deed and has a child with Johnny. Jed is ever the steadfast bystander, heart full of unrequited love. Johnny and Mary breakup, leaving room for Jed but he too sabotages their relationship. In the end the three are reunited. Like Husbands, the fade out is ambiguous. The three exit the scene arm-in-arm with neither man definitively chosen for the task of mate. At least the fade out doesn't come before Astaire can dance with nine of himself in "Puttin' on the Ritz." Another impressive feat by the great Astaire. Nixon, Rob. 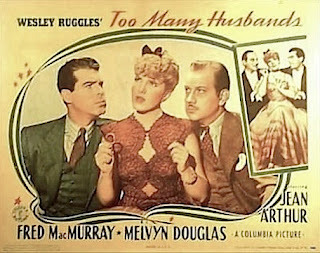 "Too Many Husbands (1940)." TCMDb Archive Materials. TCM, n.d. Web. 14 February 2016.